Owned by Chris Huele, the Invitation Only Statement Marine V-bottom will featured in the upcoming “Pain & Gain” motion picture, which is scheduled to open April 26. Can we be brutally honest, just for a moment? 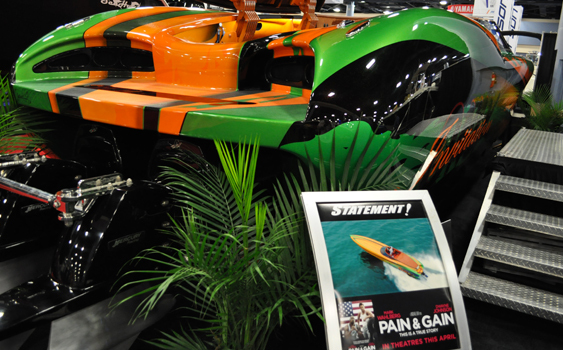 High-performance powerboats have not fared well in motion pictures during the years. Like the movies themselves, the go-fast boat action tends to be lacking. Don’t believe me? Go rent “Miami Vice”, the appalling flick based on the equally appalling television show and the insipid “The Hangover, Part II” and watch them back to back. But I have to admit, I have high hopes and great expectations for the upcoming “Pain & Gain” motion picture (watch the trailer below) that features a 42-foot Statement Marine V-bottom—the “Invitation Only” boat that is owned by Chris Huele and was on display at last week’s Miami International Boat Show. So why do I think this movie will any better—from a go-fast boat enthusiast’s perspective—than any of the dreck that came before it? Three reasons—and they all have a serious cool factor. 1. Mark Wahlberg—Not only is the guy a great actor—did you see him pretty much steal “The Departed” from the likes of Jack Nicholson, Matt Damon and Leonardo DiCaprio—but he usually makes good choices in roles. And even when he doesn’t, Wahlberg, who plays the central character in the move, is just plain fun, and funny when he wants to be, to watch. 2. The Story—“Pain & Gain” is an action-comedy based on the “unbelievable true story of a group of personal trainers in 1990s Miami who, in pursuit of the American Dream, get caught up in a criminal enterprise that goes horribly wrong,” according to a press release from Paramount Pictures. Hollywood has a knack for taking the basic truths in any story and turning them into a tall and watchable tale. Plus it’s neither a remake of something that was bad to begin with or a sequel to a successful film that should be left alone—both recipes for disaster. 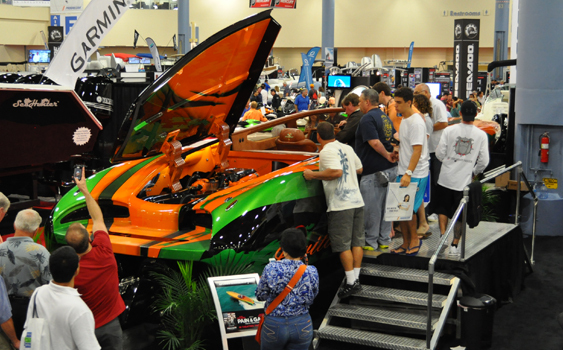 The 42-footer drew big crowds during last week’s Miami International Boat Show. What if “Pain & Gain” isn’t very good? What if there isn’t enough boat action for your tastes? Well, it certainly won’t be the first time you’ve been disappointed by a movie that featured a go-fast boat. I don’t think that’s going to happen—as I said, I have great expectations for this one—but even if it does, even if you can smell the cheese from the opening credits—this a very cool thing for a very cool boat. And that’s enough for me to plunk down 12 bucks for a ticket and 12 more for popcorn and a soft drink and settle into a dark theatre on April 26, the day the movie opens. No pain, no gain, right?